This light and easy dish takes only a few minutes to prepare and makes a very tasty side dish, base for a nice piece of fish, or a light entree. It's beautiful with almost any of the salmon recipes listed here. 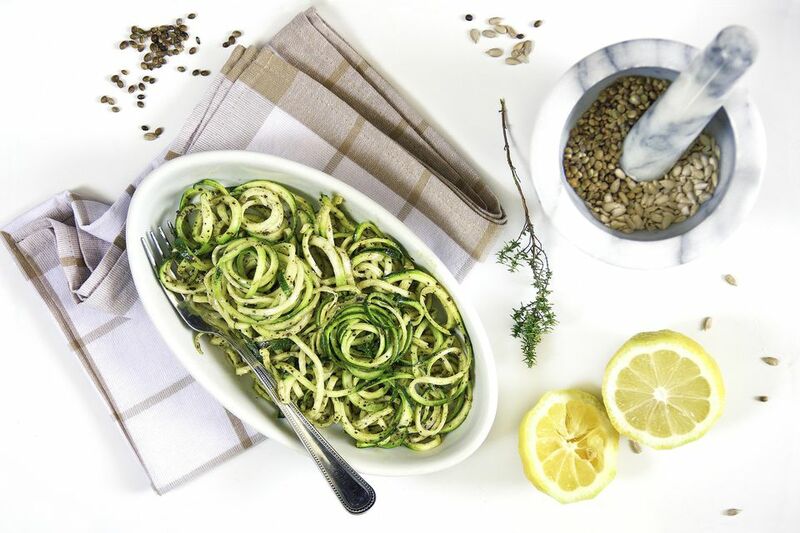 Zucchini "noodles" are quickly tossed with a light sauté of ground coriander seed, pine nuts, garlic, fresh thyme and then spritzed with lemon juice just before serving. It's one of my go-to substitutes for pasta, but it's also delicious tossed with semolina spaghetti. Parmesan cheese is an optional player in finishing this dish, and serves to give it more body and another layer of flavor. You have two options here: eat them warmed through but still essentially raw, or give them a quick sauté. either way they're delicious! Want to know how to make the noodles? You can purchase a spiralizer, use one of the small hand held spiral devices, or use the julienne shredder on your mandoline slicer. You can also use a vegetable peeler in a pinch, which will yield wide ribbons. Slice off the tips of the squash, and either spiralize or shred them into a bowl. Place the garlic, coriander seeds and pine nuts in a mortar and pestle, spice grinder or mini food processor and grind to a paste. Heat a large, heavy bottomed sauté pan over medium heat. Add the olive oil and the garlic coriander pine nut paste and sauté for 1 minute, stirring constantly. Add another light drizzle of olive oil if needed and season to taste with sea salt and plenty of freshly ground pepper. Pass parmesan cheese and lemon wedges on the side to serve. Variations: We love this dish made with a mix of yellow and green squash. You can also substitute a couple of teaspoons of Ras El Hanout for the coriander if you like your food with a more exotic and spicy flavor.